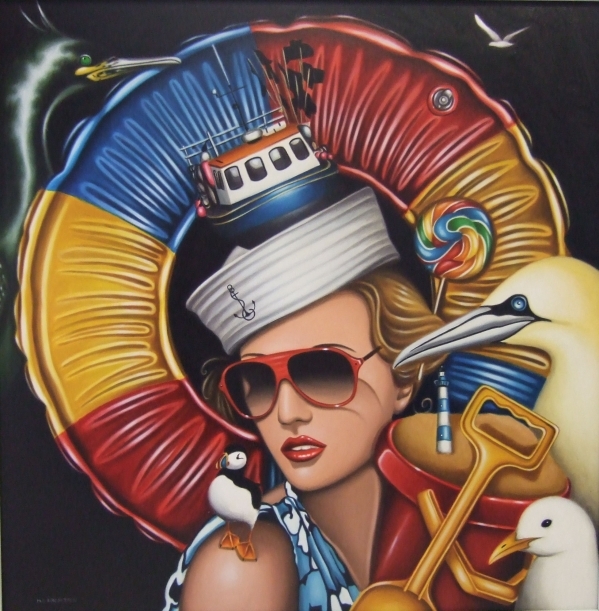 30 June to 11 August 2013You could scarcely find an image speaking more of summer and fun days at the beach than Marie Louise Wrightson’s ‘Ahoy Captain’ (see above). She is just one of the artists taking part in our annual Summer Exhibition. Join us and enjoy new work by artists including Anne Anderson, Chris Bushe RSW, Kelly-anne Cairns, Jane Charles, Tim Cockburn, Kirstie Cohen, Emma Davis RSW, Moira Ferrier RSW, George Gilbert RSW, John Glynn, Gillian Goodheir, James Harrigan, Wendy Houston, Aliisa Hyslop, D.E.Johnston, Sophie McKay Knight, Peter Layton, Drummond Mayo, Lesley Mclaren, Fiona Millar, James Orr, Barbara Robertson, Ann Ross RSW, Patricia Sadler, Stephen Shankland,Tom Shanks RSW RGI PAI, Marion Thomson, Kitty Watt, John Wetten Brown, Marie Louise Wrightson and Jim Wylie. You are invited to the opening of the exhibition on Sunday 30 June from 2 pm to 5 pm. Do join us if you can for strawberries and fizz. The strawberries won’t be our own, they’re not quite ripe yet, but they will be tasty local ones. It is likely to be a few days after the exhibition opens before it goes online at tolquhon-gallery.co.uk but if there is an artist who particularly interests you, please contact us and we shall e-mail details of their work as soon as we can. If you would like to develop your own creativity this summer, why not join one of our Weekend Workshops at our studio in Udny Green. You can enjoy Painting, Photography or Creative Writing. Our ‘Masterclass’ Workshops with Kirstie Cohen and Kelly-anne Cairns are both now fully booked but there are still a few places in Graham Fyfe’s painting weekend, ‘From Concept to Creation’. Graham is one of the most popular tutors at the studio and his weekend is sure to be fun. If you would like to get the most out of your digital camera, Ken Ingram’s workshop, ‘Pixel to Print – an Introduction’ is ideal. You can see some of the images from his regular class on their Flickr site. Click on the logo below to view. Perhaps you would like to immerse yourself in Creative Writing. Then Haworth Hodgkinson will lead you in exploring ‘A Sense of Place: Writing in Response to your Surroundings’. You can find full details of all workshops on our website or give us a ring or email for further information.